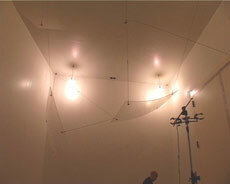 In December 2006, Spacedog assembled a group of musicians in the reverb chamber of the UK National Physical Laboratory. This room has one of the longest reverberation times in Europe. These videos show you what happened – you can read more about the project on these page. NB In these videos, the people you see on camera are the only musicians playing – no sounds have been added after the event (except during the purple intro sequence). The extra sound you’re hearing is the long tail of reverb that follows each note, as sound bounces for up to 30 seconds around this highly reflective room. You hear this tail, before you hear notes, on videos that are playing backwards. Reverberation or ‘reverb’ is what you hear when sound bounces off the walls, floor and other surfaces of a room, creating a mush of echoes that slowly die away. Acousticians judge how long sound bounces around the room by measuring the ‘reverberation time of the space’. Technically, this is how long it takes for the sound to decay by 60dB. The easiest way to make a rough judgement of the reverb in the room is to pop a balloon in there, or clap your hands. If the sudden impulse of noise – the pop or clap – dies away almost instantly, your room has a very short reverb. If it rings for some time afterwards, you have a long reverb. If you’re sitting in a small, carpeted room right now, it’s likely that your reverb time will only be around 0.5 secs. That’s scarcely enough for you to notice the sound that continues after you stop speaking. A hall that has been tailor-made for orchestral concerts might have a reverb time of around 2 to 3 seconds. A large, tiled bathroom might have a reverb of 5 secs or so. St Paul’s Cathedral has a reverb time of up to 13 seconds for bass notes. The reverberation chamber of the National Physical Laboratory (NPL) outstrips all of these. Low bass notes (around 100Hz – roughly the pitch you get on the bass string of a ‘cello) reverberate for over 30 seconds. This long reverb is no surprise when you see how the room is constructed: The room is an empty chamber with concrete floors, ceiling and walls to keep the sound bouncing around. Extra plastic panels are hung from the ceiling to add more reflective surfaces. And the walls are non-parallel so echoes bounce in all directions (this prevents the build-up of standing waves). On a visit to NPL in early 2006, I met acoustic scientist Dr Richard Lord who showed me the company’s new reverb chamber. He popped a balloon in there to show off its amazing reverb. As soon as I heard this, I knew I wanted to take some of musical instruments in there. I play various musical oddities, including a waterphone and musical saw, and I thought my sounds might find a home in this strange acoustic. NPL agreed I could come along, with some other musicians, on a day when the chamber was empty. Recording a take in the reverb chamber of the National Physical Laboratory. The longest notes on Stephen's 'cello reverberate for over 30 seconds when the room is almost empty.